p(blue). Editor's note: This is the second installment in a three-part review of Veganomicon. The first installment is available here; the final here. [%adInjectionSettings noInject=true] The pot pie lasts forever. Monday night I sauté rainbow chard with olive oil and garlic for a side dish, mixing in some of the fig dressing I made Sunday. It's nice. Eating vegan for breakfast and lunch is easy, and seems to be what I usually do anyway (soy-milk smoothies, cereal with soy milk, vegetable salads for lunch dressed only with balsamic vinegar). I feel fine in general. Tuesday night is a repeat of Monday's dinner, but I long to cook something else from Veganomicon. Many of the Amazon reviewers loved the Chickpea Cutlets, so I try them, using fresh thyme and sage. I double the recipe to use up one whole can of chickpeas. I think I forgot to double the liquid, though, so I'll try it again to see. The method is ingenious: Wheat gluten is mixed with mashed garbanzos, which is then kneaded to make a sturdy mass you can pat into cutlet shapes. I chose to bake them instead of frying to reduce the fat load. They're crispy and pretty satisfying, although a wee bit boring. I eat one with mustard and think about how they might be nice smothered in an oniony tomato sauce. [%image "reference-image" float=left width=400 caption="Muffin fun."] On Wednesday, it finally snows hard enough for my job at a school to be delayed a couple of hours. 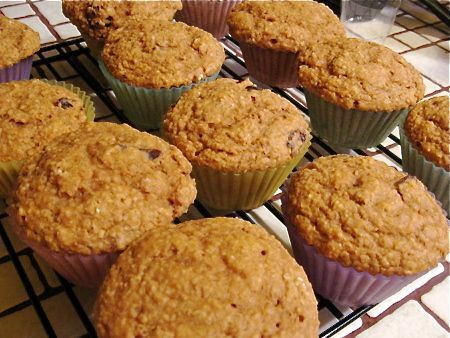 I seize the opportunity to bake the Applesauce-Oat Bran Muffins again, this time using agave syrup instead of sugar to get the muffins lower on the glycemic index, thus preventing our blood-sugar levels from spiking. I do a Web search to see how the substitution could work, and the consensus seems to be to reduce the measurement of sugar and liquid by 25 percent each, and lower the oven temperature by 25 degrees. I use dried cherries for glamour instead of raisins. The muffins turn out delicious with the agave, not much different from the sugar recipe. This one's a real keeper. On Wednesday night I meet with four old friends in the session we call "knitting" because we all used to knit together, starting about 25 years ago. Now we eat and gossip and kvetch. They must have drugged me, because I can't at all recall what we had for dinner . . . I don't cook again till Friday. The recipe for Leek and Bean Cassoulet with Biscuits looks good, so that's it for tonight. The recipe is basically a stew of vegetables and beans, topped by biscuit dough and cooked in the oven. I would change only one thing in the recipe: They ask you to add cornstarch to a lot of liquid, and I think it's better to stir some liquid into the cornstarch first to dissolve it, then add that to the main liquid. Anyway, it's really lovely to look at, but the vegetables — leeks, onions, peas, carrots, and garlic — are not exciting. I think it would be more fun with maybe greens and yams or something more full-flavored. It's a satisfying dish to eat, as they say, because you can eat a bite of biscuits and veggies together. This in no way feels like deprivation food. The technique as written is not quite right, either. 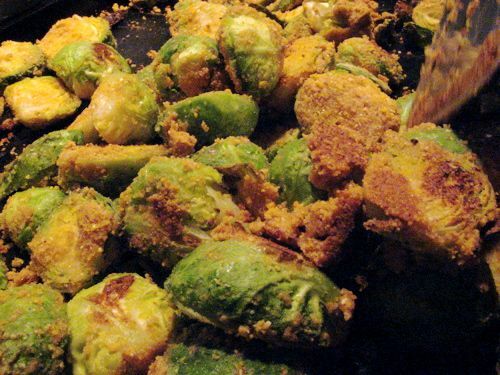 After your Brussels sprouts are washed and cut and sitting in a nice big bowl, you make the crust out of dry ingredients and oil in a small bowl. Well, then they say to add the Brussels sprouts. To the small bowl? I don't think so. I dump the crust goo into the big bowl of sprouts to mix it in. Another thing: the crust uses six tablespoons of oil. That's much too much fat and calories. I hardly ever throw food away, but this dish is a candidate for going down the drain.